Our new Hale Barns brasserie is one of our most beautiful yet. 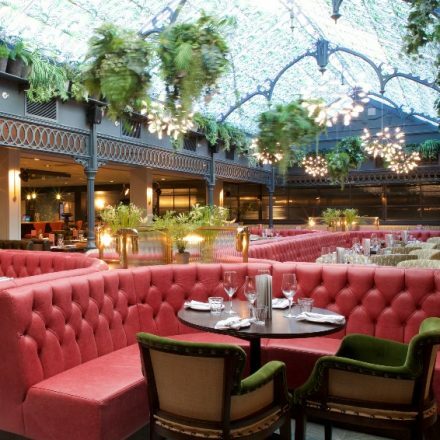 From starting a holiday the right way with a relaxed breakfast, to a catch-up dinner and drinks with friends, our contemporary bar and dining room is complete with a huge glass and wrought iron atrium roof and makes the ideal meeting space. Shelves bursting with greenery surround the light and airy space and hanging foliage alongside delicate, floaty Moooi Heracleum lights overhead creates a living roof space that will transport you to a Kew Gardens greenhouse. The botanical theme continues throughout with palm print fabrics, Marrakech Dandelion tiles, and plush banquettes upholstered in a soft, dusty orchid pink leather. Tucked away nooks embrace darker tones of sage and antique leather with velvet cushions and a mural of Van Gough’s Almond Tree in Blossom. Our bar boasts a rich yet contemporary look featuring wooden herringbone parquet flooring, brass and glass furnishings and Lee Broom cut crystal pendant lights add some classic sophistication to enjoy with a cocktail. The comfort of the indoors is taken outside onto our showstopper terrace that captures the feeling of the French Riviera with built-in banquette seating, beautiful French wrought iron garden furniture, shade for the summer, heaters for the winter and handy USB ports and sockets meaning you don’t have to sacrifice the sunshine for your working lunch. Our in-house designer Inge, talks below about her inspiration behind this stunning restaurant. What was your inspiration behind the design? We wanted the space to be welcoming, joyful and fun without compromising on the mix of old style luxe and contemporary edge that is the hallmark of our brasseries, our food and our service. What are this year’s hottest interior trends? Happy Design. A phrase coined by Elle Deco recently, but we have been moving towards it for the last two years: Loads of lovely colour and mixed textures and patterns that can be layered over existing bones of a decor scheme, and refreshed frequently, resulting in a feeling that is warm, welcoming, eclectic and uplifting. We can’t wait to welcome you into our beautiful new brasserie… Find out more & book today.